I was only about three and a half years old when our family left the old Raisin Valley Seminary in Michigan and came to live at Maple Hill Farm at Richsquare. The first thing I remember about going to Meeting was when I was about five years old and was allowed to sit with Grandmother White. I sat by her in a group of elderly women, all in Quaker dress with bonnets of black or brown or gray. They wore shawls with fringes. Grandfather White sat at the head of the Meeting on the platform in the very same chair that stands near the piano now. He was the one who would take his place and the meeting would settle into silence. There would be a good deal of silence, but one who felt impressed to do so would stand up and read from the Bible. Some others might follow, giving a talk about some phase of Christian living. There was often a vocal prayer - but always even a child could feel the spirit of prayer and worship. There was no music at that early time. Grandfather, as head of the Meeting, broke Meeting at the close. He simply reached his hand out to the man nearest him in a hand-shake. My first clear memory of Sunday School was when my first teacher was Emma Mills, a dear person who lives in loving memory. she taught us stories from the life of Jesus. About the time my brother Everett and I had started to school we had our first quarterlies with big print and even small pictures. The quarterlies were small with pretty green covers and we took great care of them. We began to learn a verse from the Bible every Sunday. She was the one who taught us our first Psalm. It was the 23rd Psalm. It was from the King James version, with the stately flowing language. I still love that version of the 23rd Psalm best of all the many excellent versions I have read. We had picture cards, too, to illustrate each lesson story. Everett and I kept ours carefully in cardboard boxes at home. We hadn't so many pictures in those days as children do now - and we treasured these cards in color. I remember when we began to sing in Sunday School. That was when the organ was brought. Ida Hiatt was the first organist I remember. She was a pretty young girl, and she had the prettiest hat in the whole congregation. I loved the mellow tone of the organ. I remember especially the melody of "Bringing in the Sheaves" for the music was full and melodious and we felt like marching when our class and older children in different classes filed in to the Meeting room where all ages met together for the closing prayer. Then came a break of ten minutes, when we children could run out to play under the trees. I must tell you how the yard was then. There were not power mowers, of course, and most of the grounds were covered in summer with waving grass. But a square space in front of the Meeting House steps was protected from wandering cows, not by a fence but by a neat line of posts rounded neatly on the top and painted white. These posts were not very tall, for the boys could easily leap over them, but they did keep cattle out. The square inside the posts was neatly mowed with a hand mower. Around the cemetery was a white board fence, and along the fence grew day lilies and blue-flowered periwinkles. All around the church then were may locust trees. In May every spring, the churchyard seemed to my childish eyes just like a fairyland. All around the churchyard near the road were hitching racks for the horses that drew the carriages and buggies in which all came to Meeting. Our carriage was a surrey with the fringe on top. There was a socket for the whip. The horses needed no whip to make them go, but the light touch of the whip cracker would tell the horse on the way to Meeting that he might go a little faster. On the way home the touch of the whip was never needed. Those horses knew t would be time for dinner when they could reach home and get to the corn and hay in their mangers. The wheels of the carriage spun merrily, and raised the dust, too, on the way home from Meeting. Meeting hours seemed long in our childhood - especially in summer when our long black stockings and high-top shoes felt so hot to our feet which had had barefoot freedom all week. We listened as much as we could and we tried not to fidget; but our eyes would stray to the windows with the waving trees outside and squirrels running up and down the tree trunks, so frisky and free. Bird wings of cardinal or blue jay flashed through the green, birds warbled their praises to God and sometimes a passing butterfly strayed right inside the window. A country child in Meeting could see lovelier scenes than stained glass windows in the stateliest cathedral. My first memories of Richsquare began, of course, after August, 1897, when our family left the old Raisin Valley Seminary near Adrian, Michigan, bought our farm from Aunt Abigail White, and moved there to live. 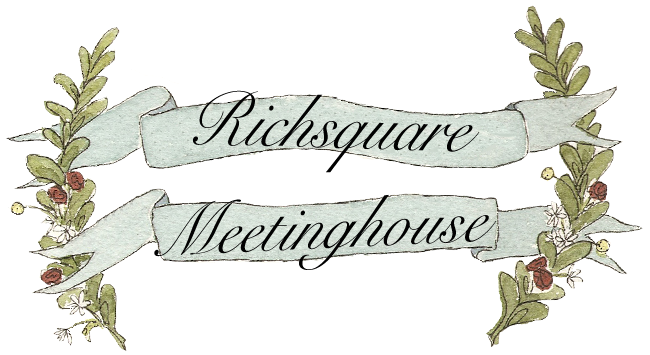 My first memories of Richsquare Meeting are of sitting in Meeting with Grandmother White. It was a privilege to be with Grandmother, and would be granted only if I were "very good." I remember feeling very small among the bonnets and shawls of those around me - Sophronia White, Lorinda Mills, Margaret Wickersham, Sarah Cosand, Louisa Wickersham, Rebecca Johnson, Caroline Bell, Elizabeth Stuart. Grandfather Thoomas N. White sat at the head of the Meeting. He was the one who "broke" Meeting at the close. There was no minister except on special occasions. There was unaccompanied singing of hymns which was beautiful to my ears. I know now that it must have been pitched correctly and kept to the right rhythm, for Gurney Gilbert, a young man with a good voice, pitched the tunes as he sat in place, and people followed his clear baritone voice. There was always a portion of scripture read and always prayers offered vocally by people scattered throughout the congregation. Most impressive of all was the long period of silent mediation and prayer at the beginning. Several people often spoke short messages. I remember William Macy, Joseph White, Louisa Wickersham, Myrton Johnson, and our father T.W. White, Will Jefferis, Emily Jefferis, and others. These Meetings seemed long to me then, and it would be, in summer, some diversion if I could see a squirrel frolicking in a tree or if a gaily painted butterfly would stray in the window, fluttering over our heads for a little while and then returning to the sunny world outside. The older women sat in the section of seats under the clock. It was in that part of the house that one could see Quaker bonnets and shawls. Farther back were the families with children - the Macys, Johnsons, Jefferis, Mills, Wickershams, Stewarts and Stuarts, Stubbs, Hiatts, Bells, Whites. There were no bonnets in that part. Toward the back sat clusters of young folks who considered themselves too old to sit with their parents but who were quiet and attentive and who joined heartily in the singing. There was the organ there which was played in Sunday School, but sat silent during Meeting This custom was out of consideration for the older Friends who had been reared in the days when a musical instrument in a religious meeting was thought irreverent. Several recalled their old Meetings in Carolina and Virginia which had all been based on silence, with freedom to speak or offer prayer, of course. In those days, holidays such as Easter and Christmas were not celebrated in Meeting. There was no Christmas tree or gift exchange then. There was no display of finery or new hats on Easter. There was a reason for this. These holidays were esteemed for their religious meaning. They were not for "creaturely activities" in Meeting - hence, the simplicity. The first departure from this strict barring of "creaturely activities," I remember, was on Sunday when , at the close of Sunday School, two big boys carried in a large clothes basket full of - what? Every child was alert: popcorn balls! These were wrapped first in waxed paper, then in colored paper, and these were handed around to all the children. This was our Christmas gift from the Sunday School. One other thing ought to be mentioned about that early departure of the younger parents from sober seriousness in Sunday School. For the sake of the younger folk they instituted an annual Sunday School picnic. True, there was no expenditure of money, but it meant a basket dinner on a weekday in August (a slack time for farming people). The picnic was always held in a grassy pasture along Flat Rock, below Albert Stewart's house. This meant hauling water in milk cans from a nearby house, cooling melons in the creek and cutting them on a clean stump. The men rigged up a horse shoe game and the women found logs to sit on as they chatted together. For the children, the great attraction was the creek and there we waded and splashed, all the happy afternoon, only wondering where there wasn't a picnic every week all summer. I remember the loyalty with which many of the older people attended those picnics, even those who had no children of their own. They packed their baskets and drove those dusty miles to come, all for the sake of pleasing the children. These same people were the ones who loved to sing the hymns, loved the organ music, and were the means of enriching our worship in the church by including music. I remember one memorable day when the Sunday School, that is, the whole Meeting, had an excursion to visit the Knightstown Soldiers and Sailors Home for orphan children. It was before cars came in. The picnic was in the lovely grounds there and we children ran all around the rolling green campus, trying out the springs and small bridges across the ravines and enjoying the beauty. There is always a darker side of life, of course. There at the Home we saw the orphans dressed in uniforms marching in rows to afternoon service. It was the first time I had ever heard about orphans. The first worry came - "Who takes care of orphans? Who takes them to buy shoes? Do the orphans hang up stockings at Christmas? And who ---- ?" I remember a representative group of the Meeting went once to hold an afternoon service for the prisoners in the New Castle jail. Our parents were of the group so Everett and I went with them as a matter of course. The Richsquare folks were ushered in to a large room, with some rows of seats at one end and the prisoners sitting in rows at the other end. They were all men, young and old. We were supposed to all be together in a fellowship but a heavy iron grill separated the Friends from the prisoners. One of the keepers remained in the room with them. I remember that we sang some hymns and somebody read Bible passages, someone spoke; but I could only look at the joyless faces on the other side of the grill. It didn't feel like a Meeting because we could not shake hands. This event was an effort of outreach beyond or peaceful protective neighborhood. By this time there was a lively interest in the Africa mission at Kaimosi in Kenya. People began making efforts to raise funds. The women formed a missionary circle which met in homes. The women took the lead, but the whole Meeting was involved. Missions became a part of the budget. The missionary circle was dropped because Friends were concerned that both men and women should keep up with Missions, and help raise our quota of support. Missionaries on furlough used to come and speak occasionally. Ever month we had a short lesson on one of our fields, Jamaica, Cuba or Africa. back in those days Ramallah was not in our Yearly Meeting budget as New England Yearly Meeting supported it alone. It was not until abut 1918 that Ramallah became a Five Years Meeting responsibility. I recall when one event of special interest in Africa came up at Richsquare. There was a famine in Kenya, and hunger was so severe around Kaimosi that many parents turned their little girls out into the forest. They could not feed them, nor could they watch them die of starvation. So these children were virtually orphans. Man parents themselves died of hunger. Some of these girls appeared at the door of two of our women missionaries, who ran a small mission station in a rather isolated place. Soon there were ten or a dozen girls whom they could not turn away. They had a primitive orphanage on their hands. An urgent appeal went out to local meetings in America for clothing for the girls - very simple garments - and for money for food supplies for them. There was a warm response. Men gave money and the women volunteered to meet in homes to sew dresses from patterns sent as guides. One meeting at our house was too large for a room in the home, so the sewing meeting moved out under the maple tree. Two sewing machines hummed. Some women cut, others basted, hemmed or sewed on buttons. They had bought strong cloth in reds, blues, yellows, and the small dresses when finished would be a joy to the African girls. The first paid minister I remember was Hiram Woolam. He lived with his family in a rented parsonage in Lewisville and served the Lewisville Meeting and Richsquare. One Sunday we would have a preacher in the morning and evening meeting would be based on silence. Next Sunday it would be reversed. Friends at this time were feeling the need for Biblical instruction and for a shepherd of the flock to emphasize gospel truth in fresh ways. That was the reason why the pastoral system became general in the Yearly Meeting. We had a succession of pastors for several years. Some years when crops were poor and prices too often low, it became increasingly difficult to meet our share of the cost of supporting a pastor. When the interurban came through, and it was practicable to bring out student ministers from Earlham to speak on Sundays and do pastoral work among the constituency, this plan was tried. I think Everett Davis was the first student minister. He was enthusiastic and willing to share the ideas and truths he himself was learning in his courses on the Bible and in sermon building. Deep experience in human life-span, of course, he did not have, being young; but he had zeal and vision and faith still untested by some of life's cruelest blows. The young people took a fresh interest and we had better attendance. It was Everett Davis who made the miniature church for missionary offerings. The little church is still used for birthday offerings. Other student pastors that came out were Eldon Mills, Herschel Folger, Leslie Shaffer, Harvey Wright, and many others, down to the present. Always through the years the local Friends have carried most of the pastoral work. We couldn't depend on a resident pastor for that. We just had to do it ourselves. I think it deepened the spiritual concern in the membership. We had no youth activities such as our present-day camps at Quaker Haven. We met young people from other local meetings at the Quarterly Meetings, but only fleetingly at best. Efforts were made in the local meetings in ways other than the Sunday School picnics of which I told about earlier. I recall when the first Children's Day exercises were held. This even was eagerly looked forward to by the girls; but the boys, especially those entering the awkward age, would hang back and try to escape being in the public eye. In fact the only motivation in their performances was actually felt by parents and teachers. This was supposed to be of a religious nature, but it actually was an evening's entertainment. There were recitations and songs and "dialogues," so-called whether there were two actors or a dozen. Even the boys could be persuaded to enjoy being in one of these, as any one person did not have to perform along the platform. There were "acting songs" for the little ones, choruses for the older ones, and there was always a marching exercise by the older girls, 12 to 16 or so. It might be a flag drill or a drill with garlands or ribbons. All the girls wore white dresses (a white dress was the accepted thing in those days anyway). We met at the church to practice several afternoons and, looking back, I can see what a trial it was for those ladies who directed the whole thing. There was Mabel Johnson laboring with the children for the music, and the others patiently drilling them for the different parts of the program. When it was time for the boys to practice their part they would have to be rounded up. Once special time the boys seemed possessed. A few climbed trees and had to be persuaded, even coerced, to descend and "behave." In the end, the Children's Day program always was a success. The community came and packed the little church and stood up at the back. The church was decorated with jars of field daisies picked by the girls in Butler's pasture. There were peonies or phlox and other garden flowers in the ever-handy pottery jars to decorate the church. Everybody did his best on the final evening, and felt satisfaction and pleasurable excitement. We who participated did realize this was a church effort and appreciate the generous words of praise for our efforts by the older people. We never thought of appreciating the ones who guided our performances, but I know now the warm encouragement we received from the older people. One memorable occasion it was decided to send two young people to a Sunday School convention at Noblesville. They were to ride in George and Stella Coffin's car, brand new, and to give a report to the Sunday School on their return. Everett and I were appointed to go as delegates from Richsquare and it was a new and thrilling experience. There was a great surge of enthusiasm for the great cause for religious education. The singing was strong and uplifting. We did give our reports later and I do know we did our best and took the responsibility seriously. It was our first effort of that kind. Along in my early youth, came into being the Young Friends group. Two important leaders in this movement in Indiana Yearly Meeting were Thomas E. Jones of Fairmount and Lilian Hayes of Dunreith Meeting. They began having summer conferences on the Earlham campus, later at rented camp grounds at Cedar Lake, Indiana. Friends got behind these efforts with their support and encouragement. Later Quaker Haven grounds became the property of Western and Indiana Yearly Meetings. The first camp was in 1927 at that place. The first wooden building was a cottage owned by Ansil Ratliff's family. For this camp, one end was fitted with an oil stove and serving counter. All other accommodations were tents and the open sky. The weather was merciful and the camp was a great success. Those sunset vespers held on the hillside overlooking the lake for 65 young attenders and their leaders, with Leslie Shaffer leading the singing, were a great inspiration. Changes came with the years - improvements came - the lovely Chapel became a reality. The camp program has resulted in strengthening the meetings and the Yearly Meetings. I remember a time when the Richsquare women made a special effort to earn some money to help pay the current pastor. This was in the days when I was the family babysitter and when Mother had to be away all day, I stayed at home to get dinner and keep an eye on the children. I did not often go, myself. There were quite a few country sales in those days - usually when some old couple had to give up farming and move to town - or when a family sold out and went west. The sale would begin about ten o'clock in the morning and continue through the noon hour and on into the afternoon when everything was sold. The men and women flocked to those sales from miles around. The smooth-tongued auctioneer always drew a crowd around him - in the barnlot where men were bidding for cattle, horses or pigs - around the furniture, dishes or quilts. Around noon there would be a little lull as people began to fill hungry and find their energies flagging. Now was the time for our Richsquare women who were all set p at a sort of quick lunch station to bring out the food. There was hot coffee sending out clouds of steam with its inviting aroma. There were shiny tin cups to serve it in. Meat patties were ready, sizzling brown and hot in "boughten" buns, baked beans, with slaw and pickles for appetizers, and pies - generous cuts from apple, custard, berry pies, etc., all home-made, of course. The price was moderate in those days. Behind the scenes there was a brisk dish washing going on. Paper plates and cups were as yet unheard of for such affairs, so there were stacks of shiny in plates to wash as the rush went on. It was hard work for those women but they stuck at it until everything was sold out. If there remained a few pies uncut, there was a brisk demand for those among the crowd. Many would willingly pay a dollar for a whole pie to take home for hungry mouths waiting there. The money made that day was always devoted toward church support and sometimes used to swell the fund being raised for our missions. The big gunny sacks of tin cups and plates were usually brought to our house to be stored in our handy back room upstairs. Next day all this tinware was washed and doused in hot water all over again, and well dried before being stored away in a warm dry corner to guard against rust. One outstanding fact about this past phase of our life that should be noted: that was the true companionship, the merry chatter and willing cooperation of those women. The day of busy neighborly commotion was a highlight, even a note of color and excitement, in their home life on the farms. In short, they enjoyed it, and they loyally loved their little country church. Hard work was a willing sacrifice. I should record what little I know of the days just before the development of the pastoral system. There are glimpses of it to be found in an old diary kept by Calvin Wasson, a minister, or rather, actually kept by his wife. They farmed on a piece of land in the neighborhood where the Mills and Hiatt families lived. Calvin's Wasson's actual calling was preaching the gospel, but in those days there was no practice of regular payment for preaching. This was frowned on a "hireling ministry." A preacher had to have other remunerative work. The Wassons ran their small farm, milked a cow or two, kept a few pigs perhaps, and turkeys and chickens. Three had to be a vegetable garden, of course, and a pasture for the cow and horse. This couple had to work hard, we know; but mostly we know of their tireless efforts for the community - visits in families, calls and ministries to the sick, attending Meeting - not just at Richsquare, but Hopwell and other meetings, as well. Calvin Wasson helped to organize and promote the temperance meetings which became a great concern in Indiana Yearly Meeting. It was a common thing for Calvin and Friends far and wide to drive over to Spiceland for a rousing temperance meeting. The things they fought against were liquor and tobacco. They had not yet heard or thought of the drug trade that now threatens our very nation. Nor had science yet linked alcohol and tobacco with the dreaded cancer. They knew these things defiled the temples of God that were their children. Hence, thousands of miles were travelled over the country roads by the feet of family driving-horses, all for a cause. Calvin Wasson traveled more than did his wife. But we must record the community service she did - welcoming the visitors who came on Meeting affairs or just giving counsel or fellowship. A woman would come with her children and spend an afternoon with her, perhaps joining with her in her gardening, canning or churning. Often the diary records that the visitors had meals there. One terse sentence well describes this good woman "giving to hospitality:" "I kept them for supper. Apple dumplin's." Both Calvin and his wife were recorded ministers and so could perform marriages. Many a time one or the other would be asked to unite a rural couple in their parlor, with previous arrangement, but bearing the necessary license to marry. Connected with the end of this diary is a reference to the call of Calvin Wasson to go to settle in the outskirts of New Castle and help found and build up the Meeting in New Castle. Olive Payne, a resident here at Friends Fellowship once recounted to me the life of the Wassons there. They lived on a small farm, kept poultry and a cow or two, cultivated a garden and a field or two, kept a driving horse and by their own labor supplemented what support the Meeting could supply. Now this is the beginning of the story of the New Castle Meeting which is still doing good work.